You don’t need to be in Italy to know how a perfect lasagne is done! 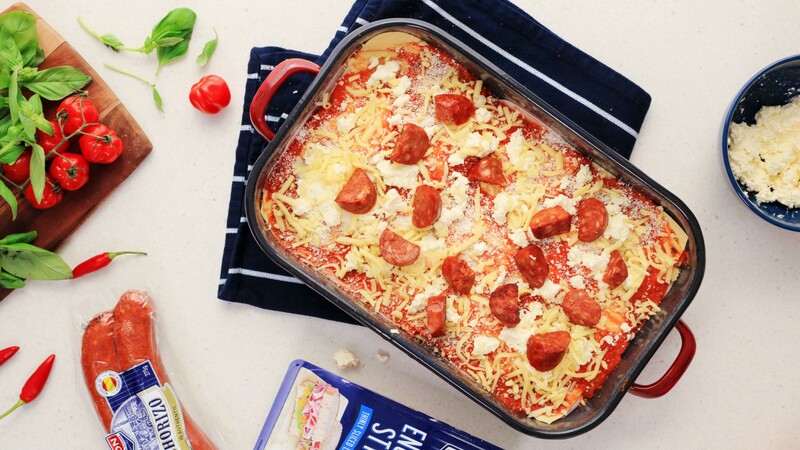 Try our delicious DON lasagne with chorizo and ham – perfect for the whole family. In a pan, heat olive oil over stovetop and panfry chorizo for 1 minute or until half-cooked. Set aside and drain on paper towel. To create the sauce, warm 3 tbsp. of olive oil and 1 tbsp. butter in a saucepan. Stir in garlic, onion, celery, carrot, parsley and chilli. Cook for 10 to 15 minutes or until vegetables are completely soft. Add tomato paste and stir for 3 minutes. Add tomatoes and chicken stock. Cover partially and simmer for 45 minutes or until thickened, stirring occasionally. Remove from heat and stir in another tbsp. of olive oil. In a baking dish, cover the base with a layer of sauce. Continue layering in the following order: lasagne sheets, sauce, crumbled ricotta, sprinkled parmesan, scattered basil leaves, DON English Style Thinly Sliced Leg Ham and more lasagne sheets. Repeat each layer another 4 times. For the top layer, spread sauce, and add chorizo and ricotta sparingly. Sprinkle with mozzarella, parmesan and basil leaves. Cook for 20-30 minutes.